A close friend of mine, lets call her “J”, asked me last week about coffee makers for campers. I had been telling her a bit about my new website here and of course she asked a question that hadn’t been directly covered here… at least until now. I know that campers tend to come in a few different varieties. There are the campers who take a big well stocked RV to a campground with full facilities. These people are often similar to those campers who like to head out to a distant campground and stay in a cabin that is furnished to some degree. Then there are people on the other end of the spectrum who like to camp in the most basic way possible. They head out into the wilderness with as little on them as possible in the direction of nothing but nature. Obviously every camper will have their own idea of what camping is and the equipment one camper brings with them is different than that of another camper. When all is taken into account however there are a few basic things that tie most campers together as one demographic group – whatever is brought along on a camping trip is rarely electric and is usually a simple product with few (if any) moving parts. Making Coffee While Camping is Very Important! When it comes to coffee makers automatic drip coffee makers which saturate kitchen counters nation wide are not an option. In some cases many cabins that people camp at have no electricity and certainly not outdoor camp sites. 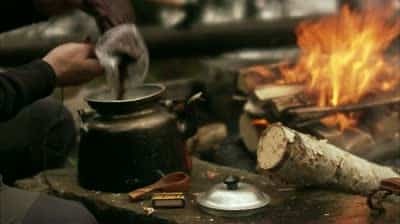 For campers of all types the best bet is to bring a non-electric coffee maker that can be operated by hand over a fire. Percolators tend to be perennial favorites among campers as they are metal pots that sit on a heat source like a fire and they just percolate away until you remove them from the heat but an better way of making coffee is to stay away from percolators and use something that doesn’t roast your coffee grind while it brews. For this I recommend either a good sturdy moka pot or a stainless steel french press. In both cases these units can be purchased inexpensively and in small enough sizes for campers who have a limited ability to hold on to “things”. Other options include small cup-sized coffee drippers. These are small cones that sit on top of a cup. You take hot water from a pot and pour it through the coffee grind sitting in the cone on top of your mug and out comes coffee. This is kind of like a DIY drip coffee maker. In any case moka pots, french press pots, and cone-style coffee drippers all make better coffee than percolators. You can see some of the better coffee makers in each category in the store. If you are looking for specific guidance in choosing a camping friendly coffee maker then read on. I’ve got some info on a few great options down below. There’s just so many options out there. Each model and brand offers different features, one better than the other. The plethora of portable coffee makers can overwhelm you. But don’t worry, we’ve got you covered. Just remember: one of the important factors to achieve good cup of coffee even away from home is to pack a good ground of coffee beans. Now, check out these coffee maker recommendations from savvy campers and travel bugs. Aerobie AeroPress – This coffee maker combines drip method and French press with a twist. The parts are easy to assemble. After you add the hot water, you can have a brewed coffee in just a few minutes. Cons: It has some loose small parts that you need to keep an eye of. Primula Single Serve Buddy – This is pure ingenuity in a cup. It has a simple design that’s easy to use and a reusable filter, perfect for camping, even for days. You get to enjoy a good cup of coffee without the fuss. Coleman Quickpot – Coleman is a favorite brand about campers and outdoor enthusiasts. You can expect nothing less for its travel coffee maker. This large and hardworking coffee maker can make 10 cups of coffee in one session. Snow Peak Titanium Café Press – This coffee maker is lightweight and very durable, perfect for the great outdoors. It may not serve a large group but you can enjoy brewed coffee with that special someone. It allows you to bring the great taste of French pressed coffee wherever you go. Hario V60 Plastic Coffee Dripper – This coffee dripper is so unassuming but it performs well beyond your expectations. It follows the standard pour-over model. It’s plastic is easy to use and retains good coffee taste. Make sure to bring paper filters with you. Insert the filter, pour hot water and you are ready to go. Jetboil Java Kit – The Jetboil Java Kit is every camper’s dream. The complete kit includes an efficient boiling equipment and French press accessories. It’s like brining a mini-stove on your camping trip. You can boil water anytime and just add the French press accessories to quickly brew a good cup of coffee whether your atop a mountain or by the beach side. GSI Outdoors Personal Java Press – One key feature of GSI is its insulated canister. This means you can make a coffee in the morning and still enjoy it warm for hours. This produces a strong coffee brew that fans of French press will surely recognize and love. Faberware Classic Stainless Steel Yosemite Percolator – It’s a handy percolator that helps you brew coffee for up to 8 people. This is a good equipment for large groups of campers. You can also reheat the coffee if you want. Since it’s a percolator, you can easily adjust your coffee flavor. Just watch out or your coffee will be over-brewed and taste burnt and bitter. GSI Outdoors Collapsible Java Drip – This is fully designed with campers in mind. It can brew coffee good for 12 people. This drip style outdoor drip machine makes good tasting coffee. It is not the lightest but it is a good alternative for bulky coffee makers. Surely, nothing beats a good cup of coffee while you are surrounded with breathtaking sights. To achieve this, you need to decide on a travel coffee maker to suit your needs. Every coffee lover agrees that making good coffee is important for a relaxing camping excursion, so don’t suffer from instant or cowboy coffee. The great outdoors offer so many good memories for families, couples or just for some alone time. Camping provides an opportunity to marvel at the wonders of nature. For coffee lovers, a good cuppa is a must! You can always go cowboy and brew your coffee the old-fashioned way. But, drinking a good brew would add to the pleasure of enjoying the beauty of nature. Just imagine: the aroma of coffee greets the sweet smelling scent of pine trees or the fresh ocean mist and wakes you up in the morning. Or a delicious cup of coffee warms you up as you watch the stars at night. Ahhh! If only you could live this kind of live every each day. But since you can only go out camping every once in a while, why not make it perfect by bringing a good quality coffee maker for camping.